The pouchjet pro II laminator is and elegant, high quality laminating system that complements any office or home environment.. 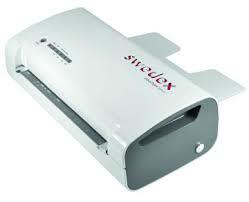 It has automatic detection, which means it automatically detects film thickness with the use of the SMART PILOT. It then adjusts the temperature and speed according to the pouch used. There are no user settings on the pouchjet pro II, the laminating machine and the pouches do all the work for you. It will always use the correct pre-programmed setting that is required for the job. Perfect lamination result due to perfect matching of temperature and velocity of the SMART PILOT. One of the biggest concerns with office equipment is safety, we have addressed this issue with the design and functionality of the pouchjet pro II. It is designed in such a way that you are unable to insert anything into the rollers if it is not scanned by the Smart Pilot first. This means that you can feel comfortable at home or at the office that someone will not injure themselves. The styling of the machine was designed to match any office environment, it is small enough not to take up any space but large enough to give you the versatility of document sizes. The ECO Friendly Swedex Smartpouch laminating film consists of high-quality and recyclable plastics polyester, ethylene vinyl-acetate (EVA) andpolyethylene. The Smartpouches are made of the highest quality to ensure that you are able to protect your document and at the same time not damage the environment. The plastic compound protects your documentation best and naturally against moisture, dust, dirt,and harmful UV radiation. 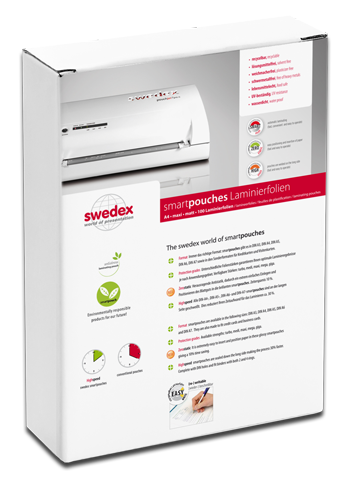 The processing and storage of the Swedex smart-pouches is free of plasticizers and solvents. This is good for your health because the room air, and thus your overall body, is not negatively impacted. Furthermore, the base material is free of heavy metals. This is especially important because no poisonous substances can be released from the laminating film in case of contact such as e.g. Mercury. You can feel secure in the knowledge that while you are laminating your document, you are not exposed to any harmful poisons that may affect your health. This also means that when you dispose of your document, none of these harmful chemicals will be released into the environment. ECO FRIENDLY PRODUCTS COMPATIBLE WITH THE ENVIRONMENT FOR OUR FUTURE!